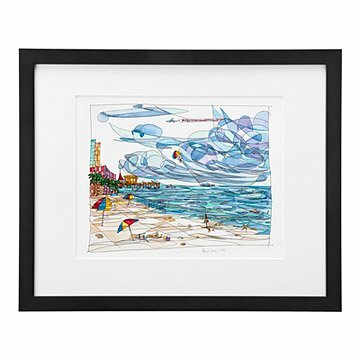 This print is part of a series that the artist created while vacationing on the Gulf Coast of Florida. Beachside, and A Sunset to Remember were all painted while vacationing on the Gulf Coast of Florida with a friend's family. The group had traveled south from Illinois by station wagon, audio recording their quirky adventure--staying only at roadside motels, eating at old-time diners, visiting the local restaurants and historical sites along the way. The road trip ended at the pristine white sandy beaches of the Panhandle of Florida, where the travelers drank sweet tea, snorkeled the crystal blue waters of the Gulf Coast and enjoyed delicious southern peach milkshakes. I can almost feel the breeze! I want our Florida condo to say, "Relax, you're on vacation" as soon as you open the door. Renee's art is perfect for that! She captures the beach so beautifully! I've bought two of her beach scenes, and cannot wait to hang them up when I return to our first vacation home. You've done it again. A beautiful accent piece. Can't wit to get it framed (black frame you offered didn'twork in my space).